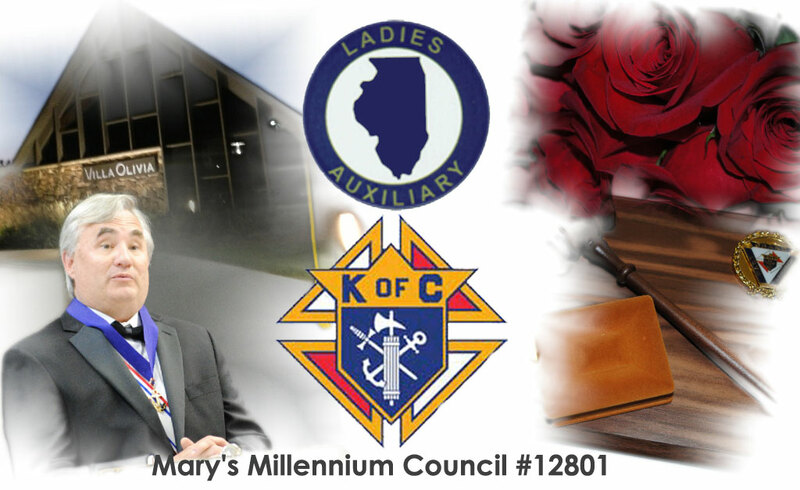 One of our main social events of the year is the annual Past Grand Knights Dinner. Once again we held the dinner at Villa Olivia Country Club in Bartlett, IL. Father Gregg and Father Greg were honored guests in attendance as well as the widows of our fallen Knights. We thank them for sharing the evening with us as we remembered their past service and honored several of our members for their current achievements. Father Gregg, our Chaplain, welcomed us and thanked us for our service to the Church and Community. There were several award presentations made during the business portion of the evening. Past Grand Knight, Loren Becht, presented Jerry Dzurovsak with the Knight of the Year award. Unfortunately, Jerry was not in attendance due to being on a business trip, so his wife accepted the award on his behalf. Family of the Year was presented to Richard & Barbara Scheffki. Auxiliary President, Joanne Lorkowski, presented Shirley Vachon with Lady of the Year award. Loren also presented Gino Martinez with the Knight of the Year award for his service to the council. Congratulations to all for these well-deserved awards. May your work provide an example to those who follow in your footsteps. For more information about each individual award, see related articles under the respective pages.